General Topics & Doctrine | A Christian Woman's Guide to Reasons for Faith: Understanding Why You Believe | Watchman Fellowship, Inc. Contents: 218 pages and notes. Our Price: $10.50 - You Save $.50! Was Jesus simply a good teacher? Will God forgive my past? 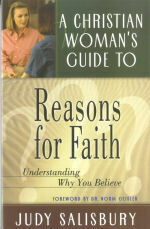 A Christian Womans Guide to Reasons for Faith will transform readers hearts as well as satisfy their minds.